"Flagstaff Airport" redirects here. 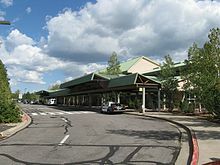 For the airport in Canada, see Killam-Sedgewick/Flagstaff Regional Airport. 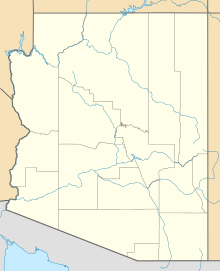 Flagstaff Pulliam Airport (IATA: FLG, ICAO: KFLG, FAA LID: FLG) is 5 miles (4.3 nmi; 8.0 km) south of Flagstaff, in Coconino County, Arizona. The airport is serviced by one airline, American Airlines, and is also used for general aviation. Federal Aviation Administration records say the airport had 51,765 passenger boardings (enplanements) in calendar year 2008, 66,627 in 2009 and 62,109 in 2010. The National Plan of Integrated Airport Systems for 2011–2015 called it a "primary commercial service" airport (more than 10,000 enplanements per year). The airport covers 763 acres (309 ha) at an elevation of 7,014 ft (2,138 m). Its one runway, 3/21, is 8,800 ft × 150 ft (2,682 m × 46 m) asphalt. In the year ending December 31, 2017, the airport had 43,527 aircraft operations, an average of 119 per day: 67% general aviation, 25% air taxi, 2% military, and 5% airline. 115 aircraft were then based at the airport: 88% single-engine, 5% multi-engine, 3% jet, 3% helicopter, and 2% ultralight. Presidential candidate and U.S. Senator John McCain's Boeing 737 campaign aircraft visited Flagstaff prior to the 2008 election. Historically, Flagstaff was served by the Frontier Airlines until 1979 with Convair 580 turboprops to Phoenix as well as direct, no change of plane CV-580 service to Denver via Gallup, NM, Farmington, NM and Durango, CO.
More recently, Horizon Air, a subsidiary of the Alaska Air Group (which also operates Alaska Airlines), operated Bombardier Q400 flights to Los Angeles before ceasing all service into Flagstaff. The 76-seat Q400 is largest and fastest member of the DHC-8 Dash 8 family of aircraft. American Eagle served the airport on behalf of American Airlines at one point with Saab 340 turboprops to Phoenix. Several commuter airlines also served Flagstaff in the past with flights primarily to Phoenix. These included Cochise Airlines, Desert Air Service, SkyWest Airlines (operating independently) and SunWest Airlines. These airlines operated commuter turboprop aircraft including Fairchild Swearingen Metroliners, Beechcraft C99s and de Havilland Canada DHC-6 Twin Otters. Piper Navajos were also used. SkyWest Airlines then began operating as the Delta Connection for Delta Air Lines flying the Metroliner between Flagstaff and Phoenix. America West Airlines de Havilland Canada DHC-8 Dash 8 turboprops flew to the former America West hub in Phoenix before this airline was merged into US Airways. America West Boeing 737-200 jetliners appeared occasionally at the airport as a back up for their Dash 8 service. America West then turned this operation over to Mesa Airlines which flew Embraer EMB-120 Brasilia and Beechcraft 1900 turboprops as America West Express between Flagstaff and Phoenix. America West then merged with US Airways which in turn continued to serve Flagstaff via US Airways Express with flights to Phoenix. US Airways was subsequently merged into American Airlines. SkyWest Airlines operating as American Eagle via a code sharing agreement with American Airlines currently operates scheduled passenger flights serving the airport with Canadair CRJ-700 regional jets to the American Airlines hub at Phoenix Sky Harbor International Airport and Dallas Fort Worth International Airport. This regional jet service marks the first time that all flights serving Flagstaff have been operated with jet aircraft. Trans States Airlines operating as United Express via a code sharing agreement with United Airlines began flights on March 31, 2019 from Flagstaff to the United Airlines hub at Denver International Airport. Twice daily round-trip flights are flown on Embraer ERJ-145 aircraft. ^ a b c d FAA Airport Master Record for FLG (Form 5010 PDF). Federal Aviation Administration. Effective May 31, 2012. ^ "RITA BTS Transtats - FLG". transtats.bts.gov. Retrieved 14 February 2019. This page was last edited on 2 April 2019, at 21:39 (UTC).